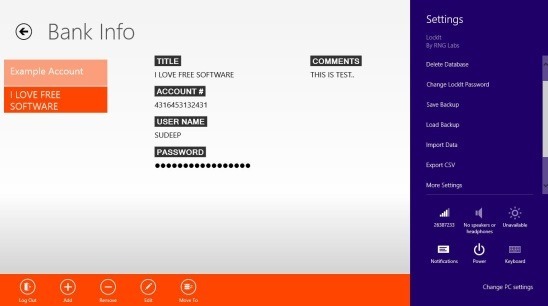 LockIt is a free Windows 8 Password Manager app. 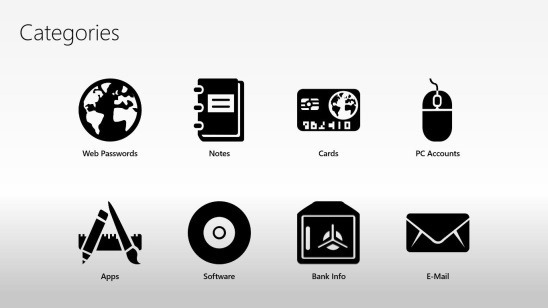 Using this app you can now save and manage passwords and other important information on your Windows 8 PC. This includes your web passwords, credit or debit card information, bank information, PC user accounts details, app’s credentials, software version and license key information, and email accounts’ credentials. LockIt uses strong military grade AES encryption technique to secure your data and keep hackers away. It password protect all your private information and automatically locks the app if it is left idle for more than 2 minutes. This further adds security to the app. Overall, the app provides efficient ways to manage password and pin-related information at one place and keeping it safe from others. Besides that, you can also create a backup of everything that you store within this Windows 8 password manager app, and load the backup any time. Also the app is nicely integrated with the Windows 8 Search and Settings charms. 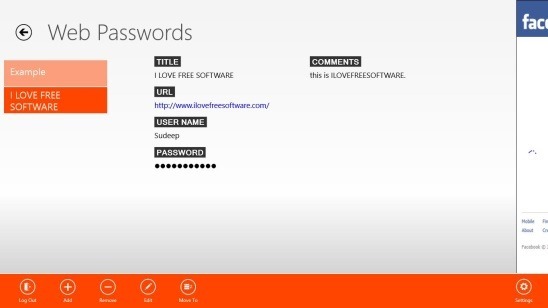 This free Windows 8 password manager app is present under the Security category in Windows Store. Use the Win + Q keys to locate the app in Windows Store, or the link at the end of this article. LockIt for sure, is a safe way to save your password data and other sensitive information. 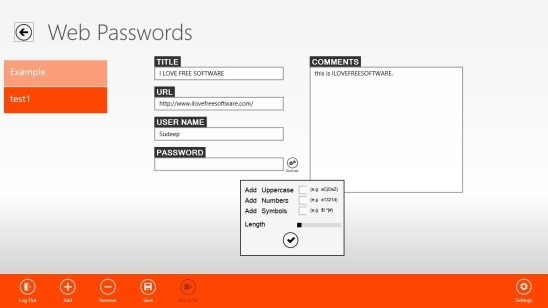 This Windows 8 password manager app is very-well designed. The UI is pretty clean, and also very easy to use. Besides adding and saving data, you can edit it any time, and even delete the desired entries. I liked the fact that the app allows keyboard shortcuts: Ctrl + N –> creating new item, Ctrl + S –> saving an item, Ctrl + E –> editing an item, with in the app. This does improves the speed of working on the app. Also there are instructions and a default template, for helping you to create and save an item (data or password). On launching the app, you’ll be asked to enter a password. This is the password that you’ll be using to unlock the app when it gets locked, and for logging in the app again. 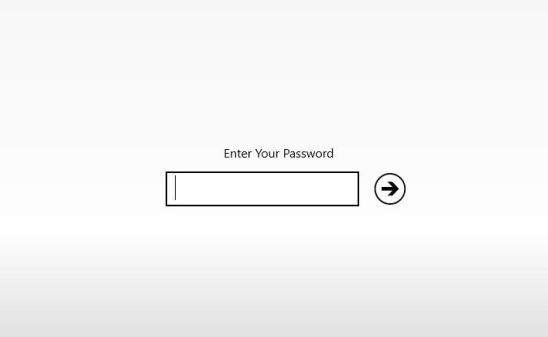 Once you enter the password, the Main Screen opens up. It contains various categories, under which you can save the data. Following are the categories: Web passwords, Notes, Cards, PC Accounts, Apps, Software, Bank Info, and E-mail. Simply click on the requisite category to save the data that you want to keep away from unwanted access. Like mentioned above, there’ll be easy to understand instructions for saving sensitive data. So, it won’t be of much problem for you to save the data. There are labels and text boxes: wherein you’ll be writing the password, username, comments, title, version etc. The labels pretty much explains what should be inside the text fields adjacent to them. Also you can make a right click on this screen (to create or edit a new item) and get a flyout at the bottom. This flyout is very much helpful, as it contains important and usable buttons, which includes: Add, Edit, Remove, Save, Settings, and Log Out. The Settings button is pretty helpful. Clicking on it opens the Windows 8 Setting Charm, containing further more powerful options. Save/Load backup in LockIt backup file type, Import/Export data in CSV file format, Change Password, and Delete Database are the important options of this flyout; others are usable but not extremely important. The best feature of this Windows 8 password manager app is its ability to lock the app automatically after two minutes. This adds more security to the app. You can set this feature to off by using the Settings charm. Here’s a quick instruction to save a data/information. Click on the desired category in Main Screen. Click on Add button at the bottom flyout, enter the password and/or other information, and finally click on Save. That’s pretty much it! 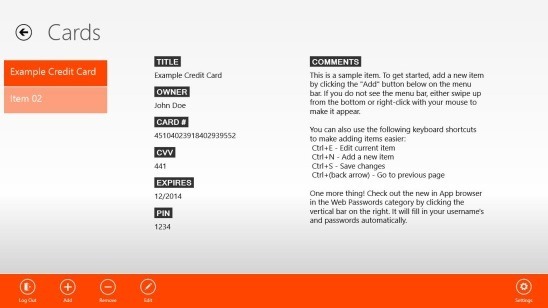 Good Windows 8 password manager app. Also check out MyVault. Securely saves multiple passwords and other information and provide good features to manage them. Automatically syncs data between different Windows 8 system. Auto locks app in two minutes, if it’s idle. Save and load backup of password database in LockIt backup file type. Import-Export password database in CSV file format. Integrated with Windows 8 Search and Settings Charm. LockIt, certainly is a good Windows 8 password manager app. It provides a big range of features, which makes the app very handy. You can use it for multiple purposes. Also, you don’t need to worry about the security, because it uses a very good encryption algorithm. Definitely worth a try. Also check out free Windows 8 text Encryption apps.